One of the most devastating and heartbreaking obstacles I've faced in my life, is the fact that it seems to be a requirement (that is if you're a "responsible adult") to get up early in the morning. Let me rephrase that.. Get up early in the morning to get your kids ready and off to school, your husband the right color socks and tie and- I don’t know- go to work... maybe... And while I know (I Know) that in this beautifully curated world of blogland that exist outside of the actual universe, a lot of people are "doing what they LOVE" in perfectly arranged kitchens while staring at the dew that gathers on their window sills (quick grab your camera). So getting up isn't as hard for them. Yet, for some of us- those forced to remain on this planet- we're on planes, trains, and automobiles at 6 am (3am for my bakery/restaurant peeps) trying to get somewhere. And no matter how much you LOVE what you do.. That alone has more Makings Of A Murderer then anything they showed about Stephen Avery. Have y'all seen that.. ? There is so much I want to say.. But it would make NO sense if you have no idea what I'm talking about.. But it's coming.. just need to wrap my head around it (it being injustice) and how the economic and socially disadvantaged are preyed on and ultimately set up to fail.. There is no justice for those that don't fit the mold. But I'll stop there. So onward.. My mornings have been a little on the rough side lately.. I've got a few projects simmering (Lord Halp Me).. And well, work. Then there's the fact that my kids would rather be forced to eat lima beans then to get their butts in gear and go to school. Everyone's still on holiday hours. This morning my 4 year old looked at me when I pulled the covers off his head and asked me "Why?" Good Question.... How do you handle the morning grind..? Especially with the onset of cold weather that makes your bones ache.. (or that might just be my age but whatever) Keeping a batch of muffins in rotation seems to help. Something people can grab as they head out the door. Most of the time way after I've already left for work. A basket full of muffins waiting used to make me smile as a kid. Even if they were just the Martha White mix. Muffins, the handheld quick bread, can easily be made the day before (make a big batch and freeze them to be reheated later). Chocolate also helps.. Lot and Lots of chocolate. Since eating a snickers bar seems to be unacceptable morning nourishment, I figured chocolate muffins would be a better idea.. You can still find the mini snickers in my bag though.. 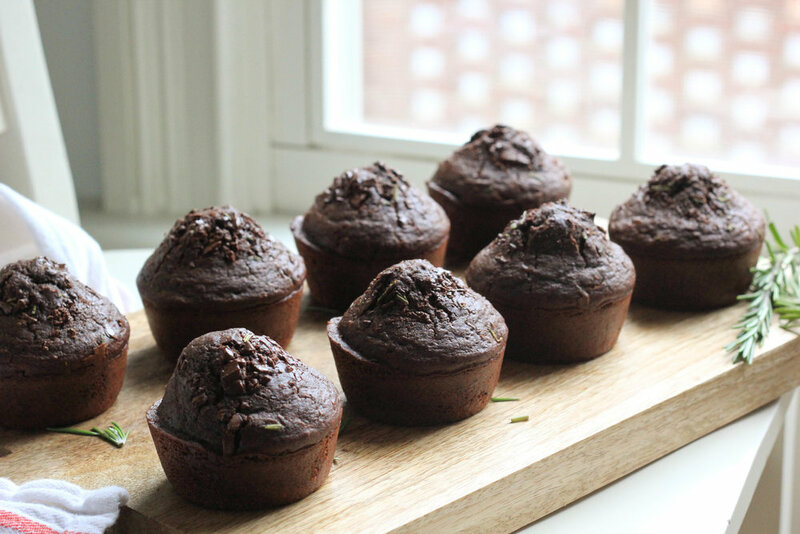 The first time I made these muffins we consumed them so quickly that I ended up making them again just a couple of days later. The rosemary and chocolate combination is wondrous and has me thinking of waffles and of course biscuits.. I mean we do eat chocolate gravy here in the south. Rosemary gives off that pine and almost mint like flavor that complements sweet dishes. Also the aroma of these baking in the oven will saturate your house and make your soul happy. Ingredients: 2 cups all purpose flour ½ cup granulated sugar ½ cup natural unsweetened cocoa powder 2 tablespoons fresh chopped rosemary 1 teaspoon baking soda ½ teaspoon salt 1 large egg 2 cups buttermilk ½ cup olive oil 4 oz bittersweet chocolate roughly chopped.